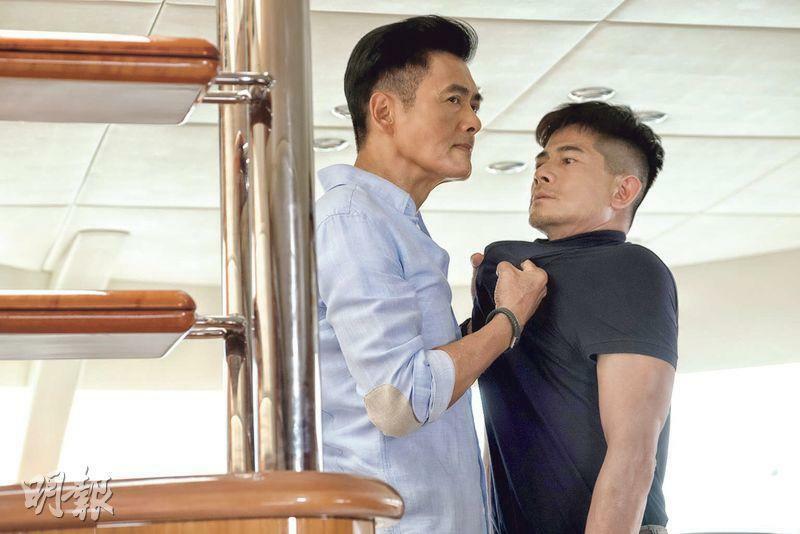 Aaron Kwok Fu Sing in the film PROJECT GUTENBERG (MO SEUNG) played a painter who was creating counterfeit U.S. currency for the criminal mastermind Chow Yun Fat. Sing Sing revealed that the director and the screen writer Felix Chong Man Keung planned for ten years. Three years ago when this sensitive subject became more lenient he was able to find investors. Then Director Chong invited him to work together. 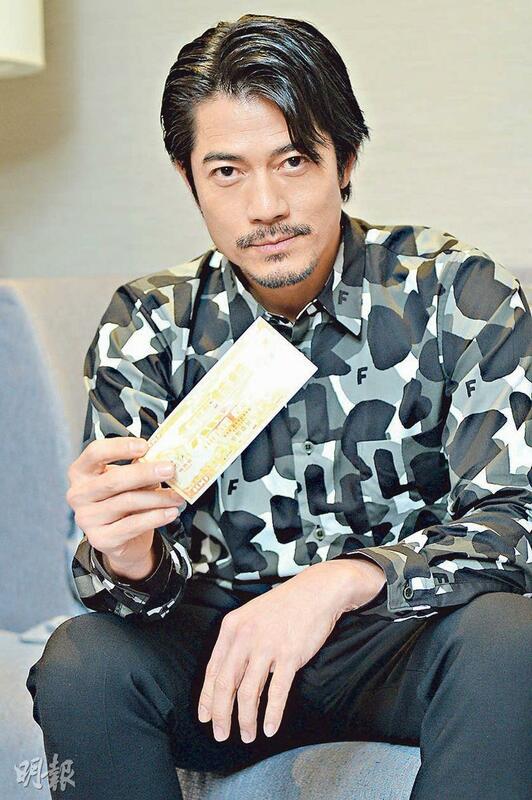 "At the time I was jumping for joy, because since INFERNAL AFFAIRS (MO GAN DOH) I was already a little fan of his. I was able to receive his admiration and trust to play such a complicated character!" Sing Sing in the past played a high ranking police officer in COLD WAR (HONG JN) to protect the people and face his family. His performance was rather singular. Even the veteran cop in PORT OF CALL (DAP HUET CHUM MUI) ran into a single case. Yet this time he and Fat Gor played two characters and Zhang Jingchu even played three roles. Sing Sing said, "Because the characters looked the same but had different identities, at first they would be a little confusing. I had to read the script six times to imagine the character in my mind. I had to do all my homework first and write a blueprint for myself. When I got to the set then the shoot went very smoothly!" With complex characters, the actors had table reads before the performance. Sing Sing said, "When we took our marks we no longer needed to, because Fat Gor would be fully prepared. He was very experienced and understood the script." Sing Sing was a Best Actor himself, but whenever he mentioned Fat Gor he had nothing but praise. With the direct confrontation this time, Sing Sing still humbly said, "More peacefully said it was a practice and an exchange. Some of excitement for the audience is from how to interact and set off spark. Actually how can I compare? Fat Gor is Fat Gor. Fat Gor on the silver screen, in front of the camera is so handsome, so cool, and so charming! His character needed exactly those, mine didn't. So I performed without any baggage! This way we were able to set off spark, if we both had to then we couldn't do it!" Sing Sing proclaimed how much fun working with Fat Gor was. "Fat Gor is a bundle of joy, when he performs he is very focused. He puts in a lot of effort into honing himself. In the film he brings back Mark Gor and ONCE A THIEF's carefree romance!" He sounded like he truly was under Fat Gor's spell. Sing Sing joked, "My hair was toasted from the 'electricity'!" Were Sing Sing's eyes just as electrifying? He said, "In the movie I couldn't use them, I couldn't resist! Because the character was very passive, I could only have the air of a painter!" Thus before the shoot Sing Sing did online research. He also a little of natural artistic talent. He already had ideas from art classes when he was little. When he had time he only would need a pencil and paper. He would occasionally draw some choreography ideas. Sing Sing said that this production was the most detailed with the currency counterfeit process in Hong Kong film. Its production even had a little American style, perfect for Fat Gor's Hollywood position. The film also had action galore. Sing Sing said, "I fired a few shots, but all the action went to Fat Gor. Before the shoot Fat Gor even hired an instructor to learn to shoot again." The film shot action scenes like the largest village explosion in Chiang Mai, indoor massacre and Canadian highway robbery of dye. Sing Sing deeply believed that the ending would be surprising and become a hot topic for the audience. "Some of the foreshadowing could be attributed to the director's expertise in character definition, but I would save that for the audience to savor. I hope this time would be a shot of confidence for Hong Kong film. It definitely won't disappoint the audience, I guarantee it! Haha!"